Cellufine ET clean S　> Reference　> MSDS / Technical Information　> Catalog No. Cellufine ET clean L　> Reference　> MSDS / Technical Information　> Catalog No. The Cellufine™ ETclean is poly(ε-lysine) immobilized Cellufine™ (cellulose spherical beads). The beads bind and remove endotoxin from your sample solution. The poly(ε-lysine) is a microbial poly(amino acid) that consist of 30-35 lysine residues produced by Streptomyces albulus. The poly(ε-lysine) as ligand and the cellulose beads act as matrix ands are products of JNC Corporation. The Cellufine™ ETclean can remove endotoxin from a cellular product solution at physiological pH, ionic strength of μ = 0.02-1.0, and 0° -25C°. *The pore size (molecular weight exclution; Mlim) of the beads was estimated from calibration curves obtained by size exclusion chromatography. Pullulan and maltose were used for the Mlim determination. 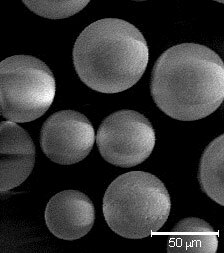 Selective adsorption of endotoxin (LPS) from a bovine serum albumin (BSA) solution by Cellufine ETclean beads. 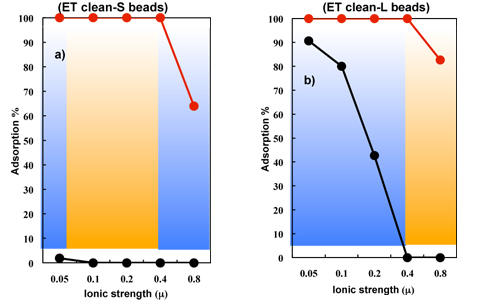 Selective adsorption of endotoxin was determined using a batchwise method with 0.2 g of the wet beads and 2 ml of a sample solution (BSA: 500 μg/ml, E. coli O111: B4 LPS: 100 ng/ml, pH 7.0, ionic strength of μ = 0.05-0.8 ). Selective removal of endotoxin from a protein solution by Cellufine™ ETclean beads. The removal of endotoxin was determined by a batchwise method with 0.3 ml of wet adsorbent and 2 ml of a protein solution (1 mg/ml) containing natural endotoxin. - Gradient 0 → 1.0 mol / l NaCl aq. 1) M. Sakata, M. Todokoro, C. Hirayama, American Biotechnol. Lab., 20 (2002) 36. 2) M. Todokoro, M. Sakata, S. Matama, M. Kunitake, J. Ohkuma, C. Hirayama, J. Liq. Chrom. & Rel. Technol., 25 (2002) 601. Cellufine ET clean was developped by Kumamoto Univ & Chisso Corp Joint Project.